Are you a vegan girl tired of the high prices for cruelty-free footwear these days? 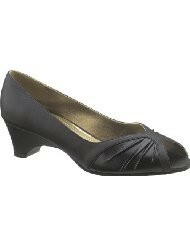 Check out these great bargains on cute, dressy leather-alternative shoes. Cheap vegan dress shoes for women are in demand. Are you a long-term veggie girl? Perhaps you have decided to become a vegan or a vegetarian lately. Many girls who choose to embrace what I call the "veggie" lifestyle can start to feel more than a slight twinge of guilt when they grab their leather jackets and throw on their sheepskin Ugg boots as they head out the door.They want to live an authentic lifestyle. For the die-hard veggie, that means finding clothes, makeup and shoes that are made without harming animal life. The problem? Have you seen how expensive these products are? Going online and looking at leather alternative footwear can almost make a girl cry. There is a real need for affordable dress shoes in this range that consist of more than pleather tennis shoes and canvas flip flops. Great looking shoes that work with professional dress codes in the workplace can be tricky to find if you happen to be a vegan and a not-so-rich bank teller or secretary. The shoes here are polished and work-worthy. The best part is the price. A basic style in a color like this will probably get a lot of mileage and stay newer-looking longer than leather. If you consider yourself an earth girl, you may have seen that particular brand name as a designer of leather alternative footwear. Most of them are nowhere near cheap, however. Many cost more than $100 dollars a pair. I don't know what makes some vegan footwear so darned expensive. A person would think that shoes made of materials that are not leather would cost less, but manufacturers are actually charging MORE for pleather these days. When I was growing up, pleather shoes were the epitome of cheapness. Now leather shoes can be purchased for less at times. One great deal on a dress shoe is the one pictured here. Sometimes a veggie girl needs a sandal that has more pizazz than a flip flop, although summer-time can be vegan paradise when it comes to cheap alternative-leather shoes. If you are lucky enough to be able to wear sandals to work, these alluring shoes have a very trendy style, yet basic shape. Where is a great place to scout around for cheaper vegan dress shoes online? All the styles here are sold on Amazon.com. Right now, Amazon is a great place to compare all the price ranges and name-brand companies making shoes for vegans.